„So Jennie“ is very likely the world´s only luxury sparkling brand with guaranteed 0% alcohol. 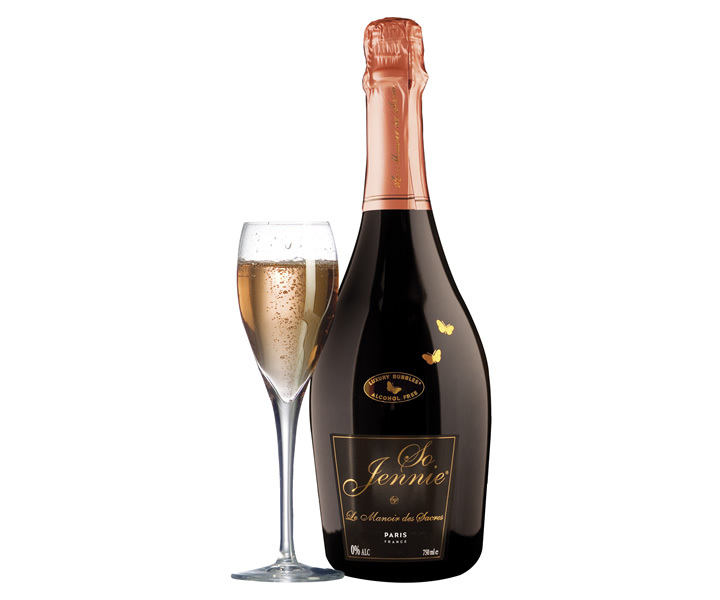 The pink-colored, fine sparkling premium drink in a luxurious black bottle, ennobled with delicate butterflies in 14 carat gold leaf, is the stylish, delicious and versatile option wherever people do not want, or cannot drink, alcohol. It’s a sparklingly special choice for anyone wanting a non-alcoholic drink while still sharing all the glamour, enjoyment and joie de vivre of a vibrant, sociable lifestyle. 100% taste of the grapes, only 32 calories a glass, no added sugar, no sulfate or preservatives and Halal certified – this is „So Jennie“. It should be enjoyed from well chilled from champagne flutes.